Charlie is a very thoughtful, patient and loving brother to his little sister Lola. She never wants to be without him. But sometimes, just sometimes, Charlie would quite like to be without Lola, especially when he wants to play with best friend Marv. So when he finally brings himself to tell Lola to leave them alone, the two friends embark on an amazing adventure… will Lola be able to stay away? How often have I heard on the TV or read aloud this phrase? It feels like zillions of times, and yet I have never got bored of it; whether it is the books, the TV series, the music CDs, or even the show we went to see last year, I unashamedly love everything about Charlie and Lola! After many successful years with Tiger Aspect (both on the small screen and in books), the charming duo is back with Lauren Child in charge, with an “original” story (as specified on the front cover!). 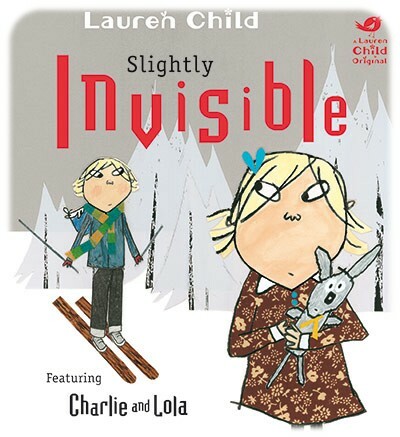 This after all only the fourth Charlie and Lola story written and illustrated by Lauren Child; all the others are tie-ins to the TV series. Child is back with her signature quirky and utterly original (often copied but never equalled) style. This new story brings a new edge to our little duo; we are used to seeing Charlie being super-patient with Lola and it is refreshing and quite a relief, to see that even angelic prefect-brother-material Charlie can sometimes lose it with his sister! But Lola, as per usual, ends up having the last word, and we love her for it! This new story is a wonderful ode to the power of imagination: not only in games and role-playing (Charlie and Marv do get themselves in the most extraordinary situations!) but also to imaginary friends, with the wonderful yet allusive Soren Lorenson taking centre stage. 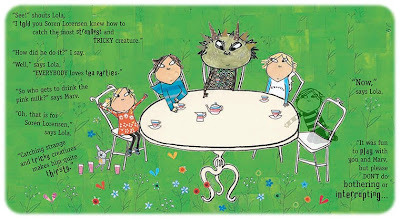 I love the way Lauren Child works with collage, and she has an amazing eye for using and mixing patterns. She uses her signature Charlie and Lola ones here, but also always sneaks in a few new ones. I am particularly taken by this one, which appears as Lola’s dress, lampshades, as well as wallpaper on the back cover. 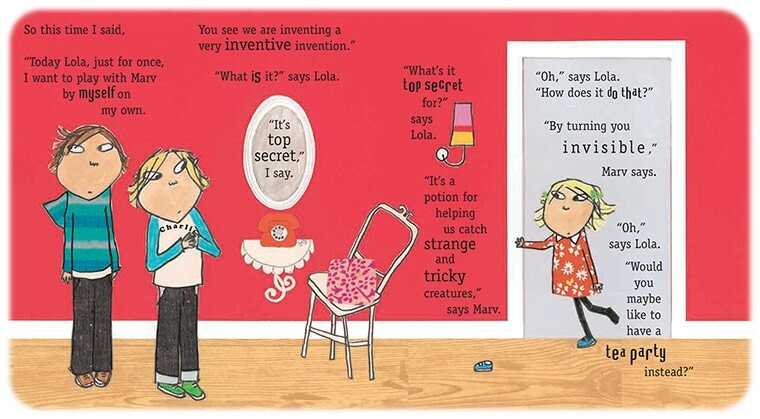 I am a big fan of all of Lauren Child’s work, but I hold a special place in my heart for Charlie and Lola. This another great book from one of the most influential British illustrators of the last fifteen years. My daughter loves this book – and so do I! We love spotting Soren Lorensen on nearly every page. It seems those girlies of ours have similar book tastes. Do you know Sarah Gibbs’ picture books? I will be reviewing both “The Princess Who Had no Kingdom” and “Rapunzel” on here soon. They are beautiful!